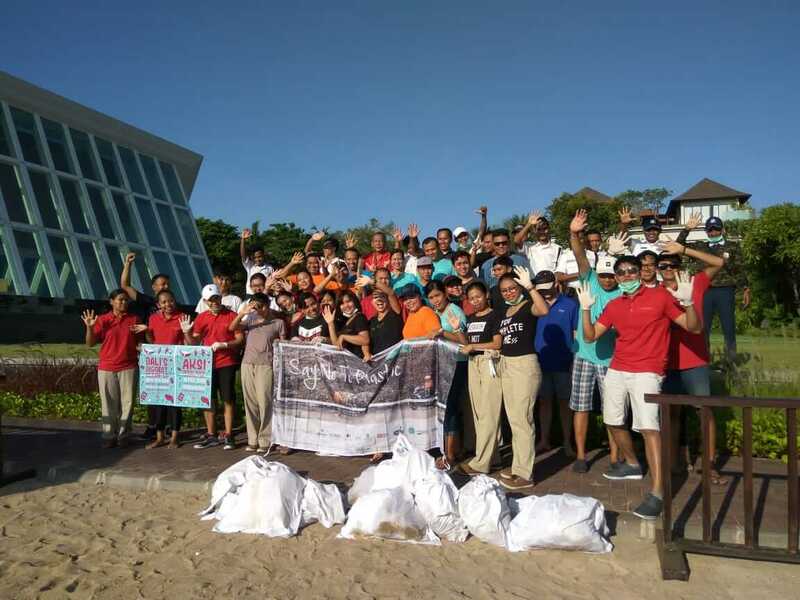 Conrad Bali, Hilton Bali Resort and Hilton Garden Inn Bali Ngurah Rai Airport join third installment of island-wide clean up initiative; collected over 30 tons of waste SINGAPORE – February 27 2019 – Hilton has announced its participation in the largest clean-up in the island of Bali to date, contributing to the collection of over 30 tons of plastic waste that would otherwise have been discarded into the ocean. Organized by Bali based network One Island One Voice, the clean-up saw the involvement of more than 13,000 people comprising team members from Hilton’s hotels in Bali: Conrad Bali, Hilton Bali Resort and Hilton Garden Inn Bali Ngurah Rai Airport alongside other hospitality companies and non-governmental organizations. SINGAPORE – February 27 2019 – Hilton has announced its participation in the largest clean-up in the island of Bali to date, contributing to the collection of over 30 tons of plastic waste that would otherwise have been discarded into the ocean. Organized by Bali based network One Island One Voice, the clean-up saw the involvement of more than 13,000 people comprising team members from Hilton’s hotels in Bali: Conrad Bali, Hilton Bali Resort and Hilton Garden Inn Bali Ngurah Rai Airport alongside other hospitality companies and non-governmental organizations. The group aimed to clean the island’s common waste products including plastic, glass and metal waste; fishing nets and cigarettes buds. In a collective effort, the activity achieved tremendous participation at over 150 locations across the island. Nearly 75 percent of waste collected was plastic waste, of which the top single-use item picked up was plastic food wraps. This is the third time the island-wide clean-up campaign is being organized. Since it began in 2017, the movement has gathered over 45,000 people in 325 locations and prevented more than 135 tons of plastic from entering the ocean. “As a global company that is celebrating 100 years of presence, it really is all about the experiences we deliver for our guests and what we can do for the communities we operate in. With our scale across the globe, Hilton can play a huge role in protecting our environment and we have started to do that by reducing the use of single-use plastics across our hotels in Indonesia and Bali. In fact, last year we stopped the use of plastic straws across our hotels, replacing them with paper straws upon request, and we are well on our way to reducing other single-use plastic products such as plastic bottles and stirrers,” said Nils-Arne Schroeder, regional general manager, Hilton, Indonesia and East Timor. In continuation in its sustainability efforts, the three Hilton hotels in Bali have partnered with global youth movement Bye Bye Plastic Bags and signed on to the Komitmen 2.0: a pledge by businesses across Bali to reduce plastic use and provide options for local alternatives. Hilton is one of the largest international hospitality companies to sign on to the agenda and as part of this initiative, the hotels continue to find ways to eliminate single-use plastics and separate organic and non-organic waste throughout their operations. “Refuse a Straw” campaign. In addition, zero soap has been sent to landfill as the hotels work with partners Soap4Hope to clean and recycle used soap for the community, and put waste reduction actions in place to reduce food waste from its buffet spreads. “It is amazing what a collective effort from the community, organizations and people who care about the environment can do. This truly speaks to the Hilton Effect we have on the community and it is very humbling to see the scale of the impact a company such as ours can make when we put concrete actions behind our plans. We are honoured to be able to do our part in this meaningful movement,” added Schroeder. Hilton currently operate five hotels across three brands in Indonesia: Conrad Hotels & Resorts, Hilton Hotels & Resorts and DoubleTree by Hilton. Over the next three to five years the company will more than triple its presence with 16 hotels due to open, including the first Waldorf Astoria in Bali and Jakarta.